Iwacu (i-WA-choo) CWS is a privately owned and independent washing station. The founder, Evariste Bizimana worked in coffee quality management for many years in Kigali but decided to return home to Nyanza to build a station specifically designed to produce low volume, high end specialty coffee. 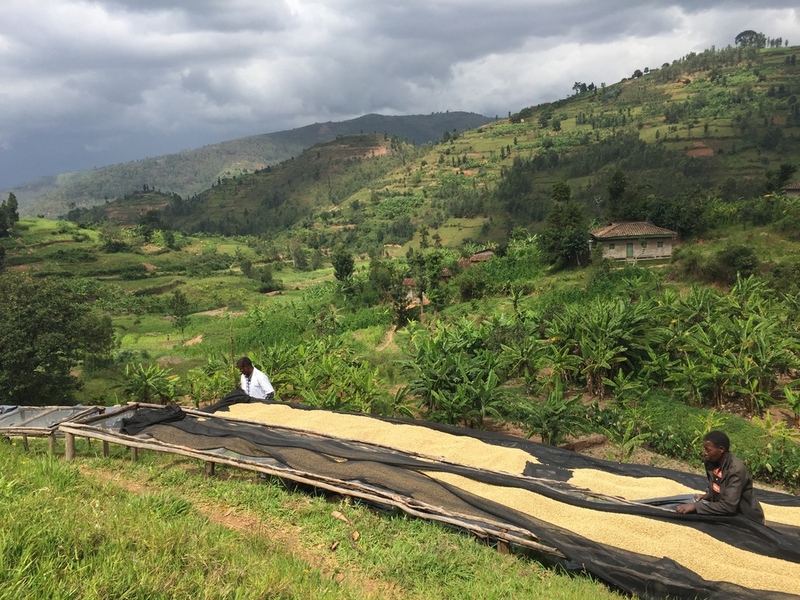 With help of the Rwanda Trading Company, Iwacu is starting to become known for its complex, layered coffee with the fruitiest acidity we've ever found in a Rwandan coffee. fully washed and dry fermented: all coffee is hand picked, depulped by a water-saving Penagos 800 pulper that removes much mucilage already, reducing the need for long fermentation. The coffee is dry fermented for 12 hours, washed with mountain water, shade dried, then sun dried on raised beds. all our coffees are shipped in GrainPro bags or similar. Iwacu CWS delivers its parchment coffee to RTC, so the coffee is packed in RTC's famous elephant-marked burlap bags. most roasters use a profile typical of Kenyan coffees to develop this light fruity, medium bodied coffee for filter. For espresso, unlike most Kenyans, this cup develops a unique spicy aroma and delicate honey-sweet aftertaste. "Full of red cherries and fresh red currants aroma. But also has black bread aroma and acidity and the more it cools down, the more reminds of a drink called kvass. Medium body." "Enormous fruit kick, reminds me of rosehip grenadine. One of my favourites, this one keeps surprising me with more layers of sweetness." "Really clean and nice - it was like black tea with lemon and honey. Fresh fruity acidity and Intensely sweet aroma with a hint of cinnamon, pomelo and black currant"
the price you pay for this coffee p/kg. This Side Up pays $7 (or €6,30) to RTC, which is 127% above the Fair Trade base price. We agreed on this price directly with the wet mill manager, disregarding the US Coffee C price. the price Iwacu CWS pays farmers for their cherries as p/kg price of green (milled) coffee. This price is often unknown to buyers. The extra €0,90 is a special This Side Up premium used to buy medical insurance for one year for farmers delivering coffee to Iwacu. For every 3,600 kg sold, all farmers are insured for one year! wet-processing costs and Iwacu management fee + dry-milling costs and exporter / port transit fee. This Side Up margin and expense coverage. Around 23% of the total price. Costs include sending samples, sales costs, travel and other company expenses. total shipping costs from Kigali to Rotterdam. We fill our containers with as much coffee as we can to keep these costs to a minimum. Evariste, Lennart, roasters from Amsterdam and Prague on their origin trip and Jean Damascene Uwimana (right), operational manager of Iwacu CWS. Evariste checking the drying process. Covering the coffee quickly when it threatens to rain is essential. The Penagos 800 pulper. Beautiful machine that reduces the need for water and long fermentation time because it removes much mucilage straight from the depulped parchment. Covered drying beds right before rainfall. Plans are being made to expand to the hill to the left. Evariste showing Lennart some pictures of smallholder farmers who received health insurance from the 2014 harvest. Shade drying beds and sorting. Temporary workers can amount to fifty at the height of the harvest season. 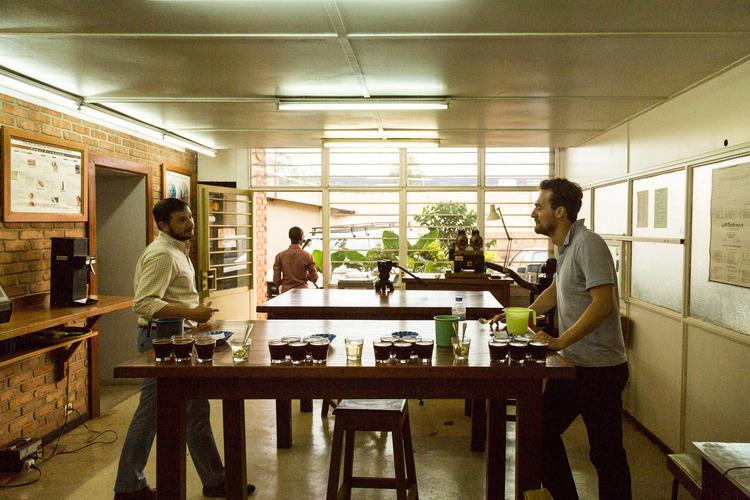 The blind cupping in 2013 that started it all. Iwacu was the third from the left and by far our favourite! Evariste Bizimana, Iwacu's manager and founder, is eager to talk to and receive guests that buy or are interested in his coffee. He has a proud collection of bags of roasted Iwacu from specialty roasters that he'd love to expand! Iwacu CWS is the only private, non cooperative-owned wet mill This Side Up trades with. Independent wet mills exist in Rwanda because of mismanagement of coops that leave behind their valuable but neglected assets. Evariste is one of over sixty Rwandan entrepreneurs to start a private company around one of these formerly cooperative-owned washing stations. However, these new companies often do not have an export licence, and rely on exporters such as the Rwanda Trading Company to attract buyers. It was at a blind cupping there that we fell in love with Iwacu’s coffee, and knew we wanted to promote this inspiring grower via our network. With the help of RTC and This Side Up, Iwacu is starting to become known in Europe for its complex, layered coffee. It’s the most fully-ripe-cherry-sweetest of the three Rwandas we promote. The founder of Iwacu is Evariste Bizimana, who has made quality control his mission for the past years. He has a long history in quality management, even at an official level at the National Agricultural Export Development Board (NAEB for short). Here, he received extensive training in quality control techniques and decided late 2012 to put these skills to the test in his own washing station. 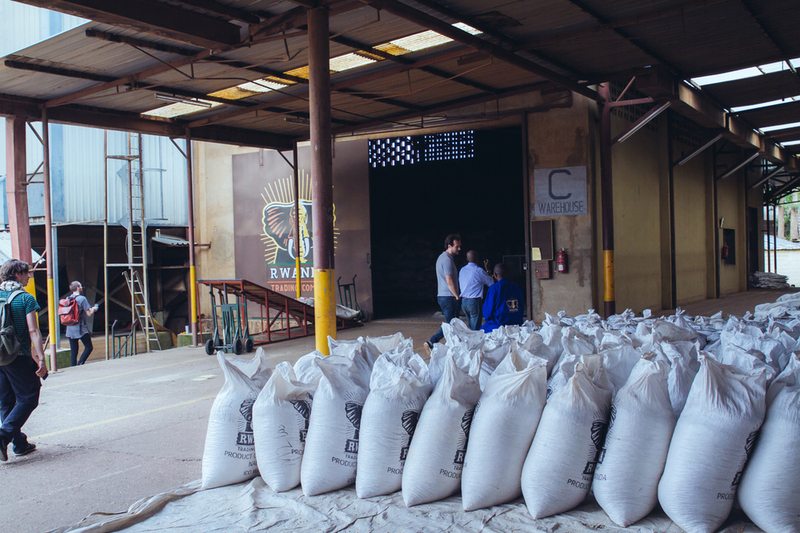 The station is known for its specialty treatment in all stages of processing, even if the processing method is simpler than at most larger Rwandan wet mills. After cherries collected from farmers have been re-sorted at the washing station, they are processed with a 800kg/hr Penagos eco-pulper before being dry fermented for 12 hours. After the dry fermentation the parchment coffee is washed and graded before being transferred to the shaded sorting tables. After one day of sorting under shade the parchment is transferred to raised drying beds for another 20 days of slow drying. The result of this quality - not volume - focused approach to processing is easy to taste in the cleanness and consistency of Iwacu’s cupping profile: in 2013, Iwacu's coffee received its first Cup of Excellence award. RTC is the exporter Iwacu partners with, and we blind-cupped Iwacu’s coffee here on our first visit to Rwanda in December 2013. Matt Smith, the former manager (who recently moved to London to work for Falcon Coffees), told us about the impressive work RTC has done in the last decade. 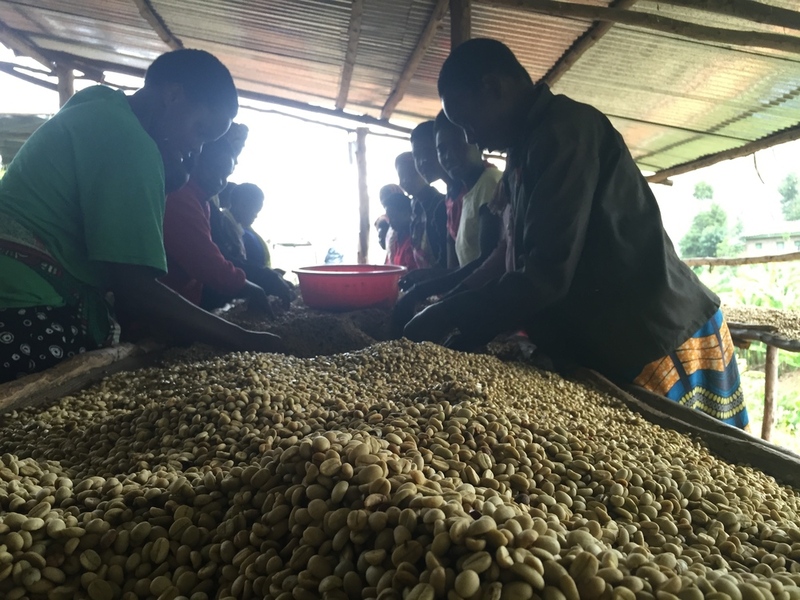 If you’ve ever had Rwandan specialty coffee, chances are it was milled and exported by RTC. 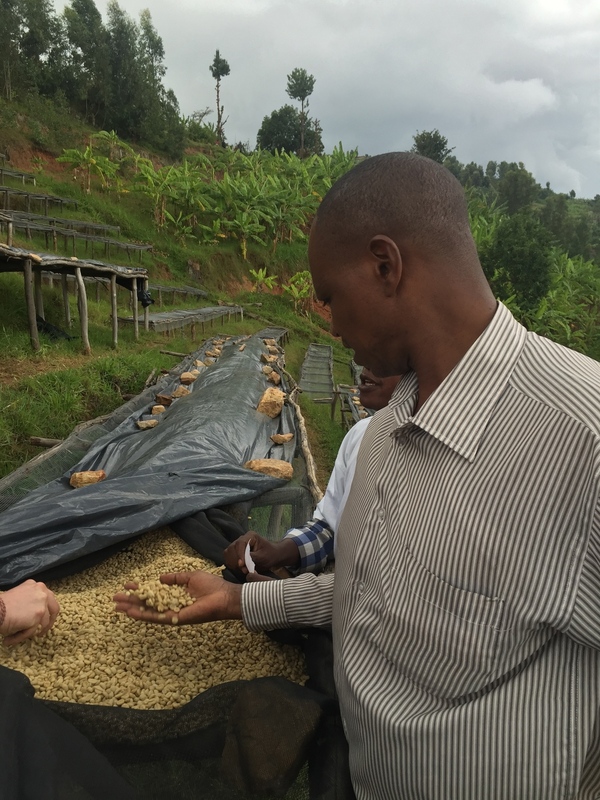 One could say RTC is even in part responsible for putting Rwandan specialty coffee on the map because it has made importing specialty coffee a lot easier for interested buyers. Last season, Iwacu procured and processed approximately 85 metric tons of coffee cherries. They plan to upgrade to a Penagos 1500 in the coming years to increase pulping capacity. They also plan to purchase the adjoining land and add drying tables so that capacity can increase incrementally. Washing tanks will be expanded as well so that waste water can be better managed. During our visit to the washing station in April 2015, Evariste explained that because of the high quality coffee produced at the wet mill, not only can Iwacu attract higher prices from international buyers like ourselves, but as a result, the entire region has started to reinvest in their (often neglected) coffee plots - now that it has become profitable for them again. We are proud to be a part of such visible economic development in the Nyanza area. With the 2014/2015 harvest, This Side Up is able to contribute to buying health insurance from a national scheme for all of Iwacu’s associated farmers. The annual contribution is about $5/person, but there are a lot of families who can't afford the contribution. Therefore, Iwacu used This Side Up's premium to pay the contribution amount for registered farmers at the washing station. Because of slow sales we first decided to skip the 2015-2016 harvest - but in the end decided to take on a small amount in our second Rwanda shipment for the coffee's most loyal fans. We hope to buy more from Evariste again next season. Not to worry, a large part of Iwacu's harvest has allegedly been bought by none other than Blue Bottle this year.